Let’s face it, we are social creatures. We learn and grow the best when we engage and interact with each other, sharing our treasured thoughts, perspectives, and opinions about the life we share together. That’s why it’s so important to speak up when you have something to say. In the long run, everybody benefits! and shared what’s really on your mind? Chaya here….My friend Daria is married to a guy with very strong Lime Power. Whenever I’d visit her in Connecticut, Steve and I would be friendly to each other, but we never really connected. After I started working with the Powers of Consciousness, I realized that my own Lime energy was really out of balance, and that I was uncomfortable with Steve because he always wanted to debate with me (about anything and everything). A growth opportunity! The next time I went for a visit, I’d really worked on my Power of Conviction. So I decided that this time, when Steve wanted to “converse” intensely with me, I would not clam up. I’d stay present, speak up, and voice my own thoughts. One night when Daria had gone to bed and I was just about to, Steve said, “Chaya, come watch the Bill O’Reilly show with me – they’re talking about this Terry Shiavo case,” which was a huge news story at the time about whether or not to unplug life support of a woman in a vegetative coma. ‘Here’s my chance,’ I thought. I straightened my shoulders, took a deep breath, called on my Lime, and followed him to the living room. I knew he and I would not be of the same opinion. The beads of sweat started to form on my forehead. But I went for it. I started to express my thoughts, weaving the facts together as I saw them. We debated for about half an hour. It was spirited, but not argumentative. We both spoke, we both listened. We didn’t change each other’s opinions, but we both learned something. I felt wrung out, but proud of myself for not disappearing. And now, thanks to my ability to ‘use my words’ even in the face of intensity, I have two friends to go visit in Connecticut. Every voice is important. Use yours! If you keep quiet, people will miss out on your perspective. Good healthy debates lead to well tested ideas. Get your facts straight, find out what’s true for you, speak up, and don’t be afraid to challenge things people say that just don’t add up to you. Feel more confident in your convictions and be ready to stand up for them – even in the face of other people’s strong opinions. Establish deeper friendships, because you’re willing to keep a lively dialogue going, rather than disengage when things get uncomfortable. Find that many people will respect and appreciate your opinion. Be more willing to listen to the opinions of others, because you’re no longer too busy holding back what YOU have to say. Speak up about that job or promotion you want and set things in motion to land it. Feel clear minded, and be able to articulate your thoughts with ease – even on a stage in front of a room full of people looking at you. 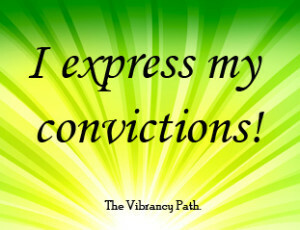 #2: Take 7 – 21 drops of Conviction Vibrancy Essence daily. It will help you step up to the plate in a lively discussion and say what’s on your mind. No will have to guess where you stand! It’s not what you say, it’s how you say it that creates conflict. Say it kindly, but just say it. “We should know what our convictions are, and stand for them. Upon one’s own philosophy, conscious or unconscious, depends one’s ultimate interpretation of the facts. Therefore it is wise to be as clear as possible about one’s subjective principles. As the man is, so will be his ultimate truth. Let’s her what you have to say! You feel betrayed in a relationship because someone lied or cheated…then you remember all the early warning signs that this person lacked integrity, and you wonder how you missed them. You cut yourself off from potentially healthy, workable relationships, because you’ve been lied to so many times that you just don’t know who to trust any more. You feel like you’re a bad judge of character because you can never tell if someone is going to act with integrity or turn out to be dishonest and slimy. You don’t want to hurt your friend’s feelings so you bend the truth a little, but then feel guilty and confused about which was better, the white lie or the pure truth. You paint yourself into a corner with one little lie, and then feel all the stress of continually covering your back to keep the real truth hidden. A few years ago we met a businessman who was convinced he knew how to help us share the Vibrancy Path with the world. He was bright, outgoing, enthusiastic, and talked about a heart-centered business model. We liked him a lot and had many hours of meetings. There were a couple things he said, sprinkled here and there, that were just slightly suspicious. We called them yellow flags (for caution). We kept paying attention. He was dangling a carrot in front of us that we were desperately hungry for. Someone who could show us how to run our business, help a lot of people, create a future for this work that would live beyond us, and bring us financial success. We had stars in our eyes. But eventually there were a couple of red flags. Some things he said that just didn’t add up. Thankfully, these warning signs were too big to miss. We declined his offer and parted amicably. Sadly, we discovered not long ago that he’s now a felon on-the-run, wanted by the FBI for fraud and embezzlement. The company he had ended up working for went under from his lack of Red-ness. In this instance, we were saved from a lot of headache and heartache by our own Powers of Honesty and the ability to recognize the red flags and respond. It’s not always easy, though. Sometimes the warning flags are very subtle. Make sure your BS Meter is properly calibrated! Not be so quick to blindly trust others, relying on your inner sense of whether or not people are speaking and acting from integrity. Notice when something isn’t adding up in your dealings with other people, and be willing to call them on it. Tell your truth with confidence, no longer letting fear get in your way of being honest. Sleep well at night, knowing that you haven’t said or done anything out of integrity….you’ve been true to yourself. Find that people want to work with you, because they know you’re a straight-shooter. Realize that it isn’t worth the complication, guilt, and hassle to cheat on your taxes or bend your morals. 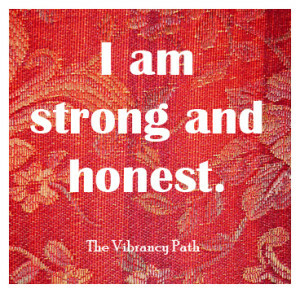 I am strong and honest! #2: Take 7 – 21 drops of Honesty Vibrancy Essence daily. This remedy will align you with the energetic frequency of Honesty, and help you keep your “Bulls… Meter” working well. Order yours HERE! from the standpoint of business relations. of equal necessity to the conduct of all business. Is your Bulls*** Meter working? Call on the Red Power of Honesty! A few years ago we met a businessman who was convinced he knew how to help us share the Vibrancy Path work with the world. He was bright, outgoing, enthusiastic, and talked about a heart-centered business model. We liked him a lot and had many hours of meetings. Not be so quick to blindly trust others, relying on your inner sense of whether or not people are speaking and acting from truth. Sleep well at night, knowing that you haven’t said or done anything dishonest….you’ve been true to yourself. Sing it to yourself or out loud 7 times. Then let the truth set you free! #2: Keep a bottle of Honesty Vibrancy Essence close by this week. Every time you feel like you are getting sucked into a vortex of lies and deceit (yours or anyone else’s), pick up that bottle and take 7 drops. Then perk up, tell it like it is, and don’t tolerate anything less than the truth from others. the flame of both must burn brightly within ourselves. Stay rooted in the truth.